Larkmead was the second stop on our first day of tasting. When we pulled up we say a beautiful white house surrounded by fields of grapes. We met our host, Sonny, who brought us into the vineyard to sample merlot grapes from the vine and discuss some of the finer details of growing. He was a southern farmer transplanted to Napa and great to chat with. We also stopped by their grape press for a moment before heading to the porch which you can see in the picture. Great view, a nice breeze, and the sun was out…perfect tasting weather. We sampled the following wines: Tocai Fruilano (old school Italian white), Sauvignon Blanc, Napa Valley Red Blend, Cabernet Sauvignon, Firebelle, and LMV Salon. The two that stood out were both were Bordeaux style blends, Firebelle (right bank) and LMV Salon (Left bank). Firebelle being the Corvette and LMV Salon being the Ferarri taste wise. Sonny shared that the LMV Salon came from a small section of grapes in their vineyard that produced exceptional grapes and that no matter how hard they’ve tried they simply cannot reproduce the quality elsewhere…and they’ve tried everything. In fact it’s so exclusive you can only get it 1 of 2 ways: buy a large package of wines or be on their Firebelle allocation list for a year and then get on the LMV Salon list. We loved the Firebelle so for us it was a no brainer, we’re on the list to get a half-case of Firebelle this winter and next summer we’ll be on the LMV Salon list. Larkmead may not be well known to the public because they do not ship to stores so the only way to get Larkmead wine is to order it directly from the Vineyard. Normally we aren’t wowed by California wine but Firebelle and LMV Salon certainly wow’ed us…If you’re adventurous and like Bordeaux I’d get on the allocation list now…the current vintage is drinkable now and will age well. Look for our reviews of these wines early-mid 2014. 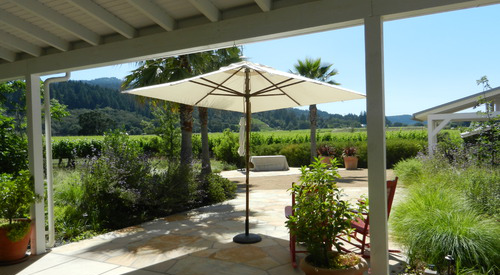 We would recommend visiting Larkmead if you’re heading to Napa just make sure to call ahead as they are appointment only. This entry was posted in California, Wineries on August 27, 2013 by colonelgrape.